The returning Lee Chilton wasted little time in proving his worth to Leamington, conjuring up a goal out of nothing to maintain Brakes’ interest in the FA Cup, writes Paul Okey. Chilton completed his move from Stourbridge on Thursday night and went straight in the starting line-up to face a side which had shipped 25 goals in their seven league fixtures. The visitors had scored 21 themselves in that time, but those anticipating a goal-fest were left disappointed as, save for a late Leamington flurry, goalmouth action remained sparse. Referee Adam Matthews clearly saw the way the game was going to go and decided to help things along by awarding the Daniels a penalty in the fourth minute. A bout of pinball in midfield left Ryan Robbins and Tony Breeden converging on the ball just inside the Leamington box and despite the home number one getting firm contact on the ball, Robbins’ tumble had Matthews pointing to the spot. Further insult was spared when Breeden escaped with a yellow. Andy Hall was in no mood to turn down a gift horse, sending Breeden the wrong way from the spot in what was to prove one of only two shots on target for the visitors all afternoon. 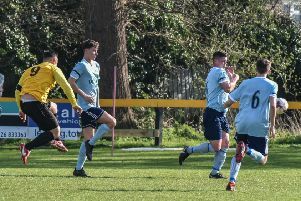 Brakes could have been level three minutes later when James Mace unselfishly laid the ball off in the box to Ben Mackey who scooped his shot over keeper Richard Knight but saw it sail agonisingly over the bar. Richard Taundry had a couple of long-range efforts which failed to test Knight, while a Mace header lacked the power to unduly test the stopper. The performance had all the hallmarks of another tame FA Cup exit, with the frustration on the sidelines transmitting itself on to the pitch as passes went astray and decisions were constantly questioned. A Joe Magunda turn and shot which whistled past a post offered hope of more for the second half, but the pattern remained, with the referee’s whistle an ever-present. Ben Mackey had a sight of goal in the 66th minute only to be crowded out, with the subsequent award of a goal kick only ratcheting up the sense that it was not going to be the home side’s day. But just as hope was fading, Chilton came to life with an exquisite finish from Jack Edwards’ pass evading Knight and going in off the far post. Almost instantly, the New Windmill rose from its stupor and Brakes sensed the game was there for the winning. Chilton became the go-to outlet as Stamford’s defensive surety was unmasked as a wafer-thin facade. An almighty scramble ended with a Chilton shot being deflected over the bar and substitute Will Green should have at least hit the target after rising first to meet Jamie Hood’s header in the box. Green was then inches from making contact with a Chilton cross-shot as it fizzed across the face of goal. Stamford were on the ropes, but Knight remained steadfast, producing a fine stop with his foot after Chilton had slipped Edwards free on the edge of the box. Chilton was next to test the veteran, cutting inside at pace before unleashing a shot which Knight diverted away from the top corner. Opportunities continued to present themselves as the full-time whistle loomed, with Hood snatching at his moment of glory with a shot on the turn that cleared the bar. Green had the final chance to avoid a Tuesday night trip into Lincolnshire, but Knight again stood up well to deny the substitute. Brakes: Tony Breeden , Ben George, Connor Gudger, Joe Magunda (James Fry, 88), Jamie Hood, James Mace, Lee Moore (Ross Oulton, 86), Richard Taundry, Ben Mackey (Will Green, 75), Jack Edwards, Lee Chilton. Subs not used: Reece Mitchell, Jamie Tank, Martyn Naylor, Eddy Caveizel-Cox. Stamford AFC: Richard Knight, Jon Challinor, Lynas King, Lewis Carr, Richard Jones , Jordan Smith, David Bell, Andy Hall (Jordan Neil, 86), Lee Chilton Smith, Daniel Clements, Ryan Robbins. Subs not used: Nathan Hicks, Dalton Bettles, Cameron Powell, David Staff.